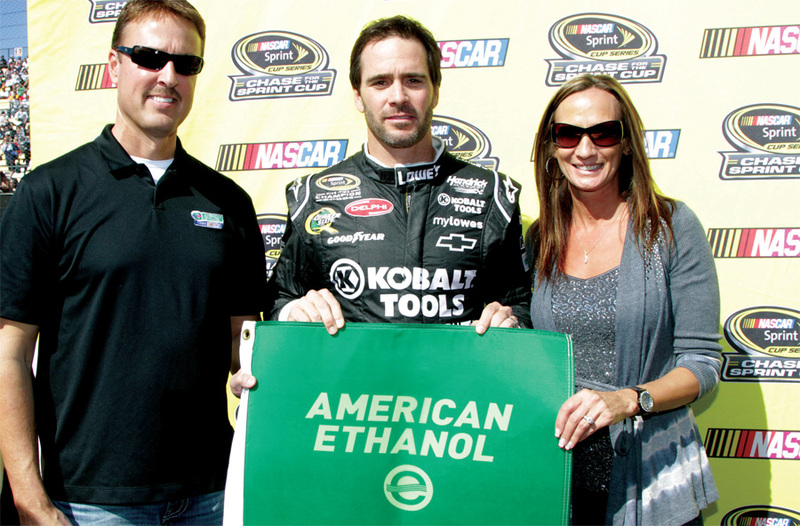 The 2012 NASCAR season has been an exciting and rewarding year for American Ethanol. American Ethanol has experienced tremendous growth as an official NASCAR partner and team sponsor, beginning with a strong presence in Daytona in February and through the American Ethanol national sweepstakes and ad campaign. Track promotions during the summer and a rewarding fall also grew public awareness. As a result of American Ethanol’s presence in the sport and ongoing promotion of ethanol, significant growth has been seen in support for E15 among NASCAR Fans with more than 66 percent of fans supporting the use of ethanol as a way to increase U.S. energy independence. The 2012 NASCAR season came to a dramatic close in Miami where all three series crowned their respective champions. In the NASCAR Sprint Cup Series™, Brad Keselowski edged out Clint Bowyer and five-time NASCAR Sprint Cup Series Champion™ to capture his first title by a 39 point margin and mark the end of an exciting season. Ricky Stenhouse, Jr. took home his second straight NASCAR Nationwide Series™ title after battling Elliot Sadler for every position in the final races of the season. James Buescher triumphed in the NASCAR Camping World Truck Series™ after winning an impressive four races. American Ethanol is proud to recognize the American Ethanol Green Flag Restart Award Winners for their consistent excellence on restarts throughout the season. Five-time NASCAR Sprint Cup Series Champion™ Jimmie Johnson won the award for the NASCAR Sprint Cup Series™ and was presented the award during the Myers Brothers Luncheon in Las Vegas by Growth Energy CEO Tom Buis. NASCAR Nationwide Series Champion™, Ricky Stenhouse Jr. and NASCAR Camping World Truck Series Champion™, James Buescher took home the American Ethanol Green Flag Awards in their respective series. Throughout the season, Austin Dillon has served as an exemplary spokesman for the American Ethanol brand both on and off the track. He raced the American Ethanol No. 3 Chevrolet in six NASCAR Nationwide Series™ races and the #33 in the NASCAR Sprint Cup Series™ race at Michigan. He has consistently been a vocal advocate for the ethanol industry. Always eager to educate fans on the benefits of ethanol as a fuel, Dillon participated in numerous media interviews, fan appearances, and starred in the American Ethanol Sweepstakes commercial that aired nationally on TNT. In his first season in the NASCAR Nationwide Series™, Austin Dillon achieved remarkable results and won 2012 NASCAR Nationwide Series Sunoco Rookie of the Year Award! Over the course of the season, Dillon racked up two victories and 27 top ten finishes and finished third in the overall points standings. His success is a tremendous accomplishment for the American Ethanol brand.